Should you purchase one of the electric mowers that are available or stick with a standard gas mower that you have likely used for many years? This is the big question for a lot of consumers. They ask themselves this question as they become more aware of environmental issues. They want to make a contribution. Even if it is in a small way by using less gasoline and oil in their daily lives. Then there is the convenience of not needing to purchase and store gasoline. You do not need to store it around your home or service your lawn mower when it needs an oil change. If you have a relatively small yard to cut, electric mowers are a potential solution. You can cut the lawn easily with one battery charge. Or with a lawn mower that is electric but needs to be powered by an electric extension chord. As you approach 1/4 acre in size, you begin to test the limits of your battery. You may be unable to finish cutting the lawn with one charge. Note that as the battery ages, it will store less and less power. At some point a second battery may be required. For the writer who has a larger lawn to mow, an electric powered lawn mower is really not an option. However if one was available that would be able to cut the lawn on one battery charge, I would definitely consider one of the electric mowers. I would not need store oil and gasoline around my home. This can be a fire hazard and an environmental issue for me. I would definitely like to move away from a gas powered lawn mower. I will consider an electric mower with two batteries to do the job. Buying electric mowers that are powered by extension chords is really not an option for me. I do not have the patience to deal with the chord. We have lots of trees and shrubs to cut around in our yard. Too much hassle for me in this case. Electric lawn mowers have become very popular in the past few years due to the environmental impact of gas engines and the fact there is much less upkeep with an electric lawn mower. However electric lawn mowers are not for everyone. It is important for consumers to consider the issues before they make a purchase. For example do you want one with a chord or one that is battery operated? How much lawn do you have to mow? And what about bagging grass clippings? The general guideline is that if you have more than a 1/4 acre to cut, you probably should go with a gas mower. Under that and battery operated lawn mowers or chorded lawn mowers can do the job. The battery charge will last long enough to complete the job. Batteries age over time. Your battery may not last as long as it once did and you may have to invest in another. You may not get the power assist feature on electric lawn mowers. This takes a lot of power and larger batteries. 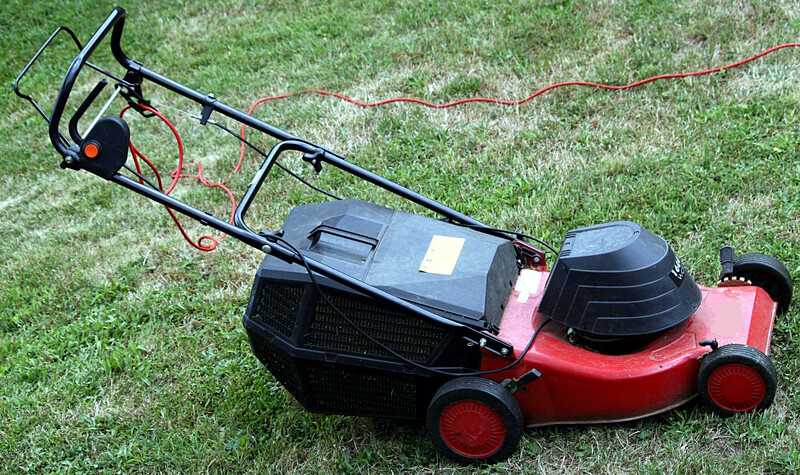 Most consumers really do not want to have to deal with an electric extension chord to power their lawn mower. It is always getting in the way. You have to stretch it around shrubs and other obstacles that you may have in your yard. The big advantage of an electric lawn mower of course is that there are no oil changes needed and there is no gasoline to purchase or store on your property. This also has a positive environmental impact in terms of operation since these liquids are not being used and do not need to be disposed of i.e. the oil. For the electric battery operated lawn mowers consumers should still dispose of old batteries properly to avoid releasing heavy metal contamination at our landfills.